I was lucky enough to go to Feast in the summer, and enjoyed a wide range of food and drink from some very good producers. Now it's back for 4 days in early December - with live music in the evenings. There's an entrance fee, but you also pay a reduced rate for food once you're inside. 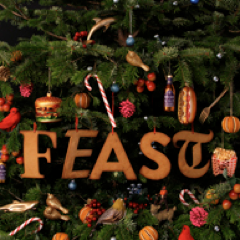 "After this summer's sold out event at Guys Quad, FEAST is back with a festive punch. We’ll be transforming a never-before used Victorian sorting office into a spectacular seasonal setting for a boisterous Christmas banquet. London’s street food heroes will come together with a hand picked selection of the capital’s most exciting chefs. The lineup includes HIX, Mishkin's, Ceviche, Gordon Ramsay’s York and Albany as well as Lucky Chip, Big Apple Hot Dogs, Lily Vanilli, Yum Bun and Pizza Pilgrims. Join us from the 6th – 9th December for great food, experimental cocktails and performances from the Woodburner collective. Oh… we’ll also be selling Christmas trees so you can take home the festive cheer. FEAST is a covered event and there will be heating but it's December so make sure you wrap up warm - the more christmas jumpers the better!"